Very common in Africa is the use of some mathematical logic while making drawings of all kinds. The fourth chapter shows how schemes in the sand and on clothing have an abundance of structural characteristics, going from abstract graphs over geometric entertainments with elementary figures to repetitive fractal structures. 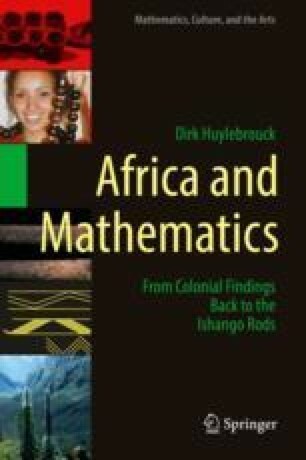 Some of these examples are debatable, such as the alleged golden section proportion in African art or the fractal properties found in nature, and that is emphasized as well.